jayrope is an audiotic from Berlin & runs this website, besides generating other troubles. Prokop Holoubek runs the Brno-based festival NewNew and – besides occasionally managing his own favourite bands – is a very active musician himself playing with the infamous crossover elektro future pop Czech band Midi Lidi, and not to forget Total Napalm Pice as well, who don;t hold back in going more artsy, humorous and cheaper-stylish, than anyone has ever gone before. bcm is borderline cyclops machine, founder of Digital Kranky Records, Berlin. Uses the pseudonyms candyflip for dj-ing at rare occasions, The Acidfarm! for creative (graphic-)output, and – with a twinkle, although you can’t see it – Metrosexual Superpower at some social network. Jean-Marie Dhur, by the name Wald und Wiese, is a Berlin-based DJ of eclectic and lounging music, oftenly to be found on sunday occasions at club KdR. He’s also into an independent and traveling film showcase, which goes by the name of Moviemiento. Find more of his musical tastes at least on his Myspace site. Lee Thompson is a Canadian writer and musician, releasing his original songwriting packed in a warm coat of experimental music using aliases Pipher, and Zizziz, partly on the well-respected Mexican online label Dog Eared Records. projects, turntables, vacuumcleaners, letters and bands. He puts his ears into a samtbody to become a velvet hollywood sometimes and will tell significant stories then of how to avoid to get old and wet. Monica DiFrancesco is The Cheap Poet [Myspace site]. Her debut album came out on Umor Records, Mexico. Download it for free. in 2007. She’ll be drooling aurora borealis all over your opalescent rooftops, especially in conjunction with her illustrations on poesiabarata.com. This is her superior profession laying the real base for her colorful & future-proof music works. All those electronica posers can go home, when she touches her toy harp. Resisting narrow stylistic or genre conventions since he first appeared as Low Res in 1994, Daniel Zelonky has emerged as a keeper of the flame of ambitious and adventurous, yet rambunctiously entertaining American music. He has woven any number of improbably wondrous hybrid styles with a mischeivous humor and unabashed over-the-top approach to musical arrangement and expression, garnering critical praise and a cult following since his 1994 debut on record. Henceforth, Zelonky’s work (and band) will go under the name Suite Crude Revue to reflect the increasing propensity to this sort of showmanship. The previous Low Res albums, Approximate Love Boat, and Blue Ramen, have been internationally acclaimed and are currently available again on iTunes. Look Back With Knife, a collection of unreleased, rare & live tracks, and an early works and outtakes set entitled 15 Exitos Grandes De Electro, are also available on iTunes and other services concurrent with the release of Suite Crude. 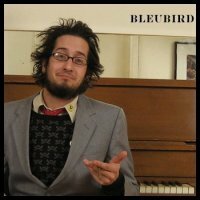 Bleubird is originally from Florida. Coming in via Montreal he is now about to find a new home in Berlin. He gets asked a lot to rap/shout/sing his poetry & lyrics all over Europe’s finest underground locations – together with “DJ CD-Player”, who serves a load of future music, that the word “HipHop” can just fractionally describe. Guy Bartell is a composer and performer based in the mythical English city of Bristol. He is the Force majeure behind Bronnt Industries Kapital, an electro-acoustic/italo-kraut-disco collective, and also plays in the earth-bound manifestation of Duncan Fleming’s astral conduit War Against Sleep. Anton Maiof is a composer and performer, who lives in the city of Bristol and is currently playing in GEISHA [Noise Rock], DTV [Quabalistic Drone], BRONNT INDUSTRIES KAPITAL [Lazerfunk], MAIOVVI & FORTUNA [Progressive Italo Disco] as well as a solo improviser and film and theatre composer [www.myspace.com/antonmaiof]. Kiki Bohemia is a Berlin music celebrity of her own. Besides being the daughter of a very influential father, who is a songwriter of GDR fame, she does her own songs & music independently from recent hipness in a haunting, electronics-savy way. She was called “a talent of the century” before: Her solo & charming antipop works can only be slightly indicated by above list of favs. Listen yourself. Son of Rose – Demo / ?? Hermine Demoriane – Lonely at the Top / 1981 ?? Kuusumun Profeetta – Kudein kaappiaan selissään skantaa / 2002 ?? Xenia Helms aka Minimatika is one half of Berlin’s now temporary underground ex-location Zentrale Randlage. She’s a connaisseur of the listening to COMPLETE albums in her cd player and a connaisseur of single tracks in goddarn itunes, just like you. this is the kit – ? Slowlearner is one half of The Sighs, the poetry, the voice and a decidated conceptualist aswell. He inhaled the bloody bloody songs at very young age already. 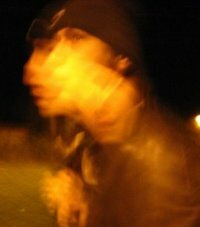 Neil Carlill was the long time singer and poetrist for the UK based mid90s band Delicatessen. His recent project Vedette is a seducing mix of ambient, noise, beats and poetry and among the most interesting we heard in 2005 and 2006. Vedette’s first album will be released on Belgium’s Stilll Records (Myspace ) on November 03, 2006. Vardi is a wonderful new band from Iceland around Hallvardur Asgeirsson. Of course there’s a myspace site, but you should definately go to their own music pages and be entwined with their near arctic and modern orchestral whyness. kind of art rock. and soooo very good! Suska Lovestar is a singer/songwriter and oftenly in Berlin. She is honest to the bone, on stage, and wearing one of her many animal costumes, light-footed and sincere, voice clear, eyes blue like rain on a lonely summer’s day. DJ Snakefinger sings and plays Moog with the outstanding Berlin based band Program and regularly spins his outstanding collection aswell at various Berlin music holes like the 8mm bar. Horton Jupiter is a Man of World, who – despite hippie community troubles congeniously continues contributing songs, vocals and electronics for the London based Sun Ra Successor band They came from the stars I saw them.